So, it’s really great to see some companies available in the UK paving the way in sustainability and becoming more environmentally friendly. 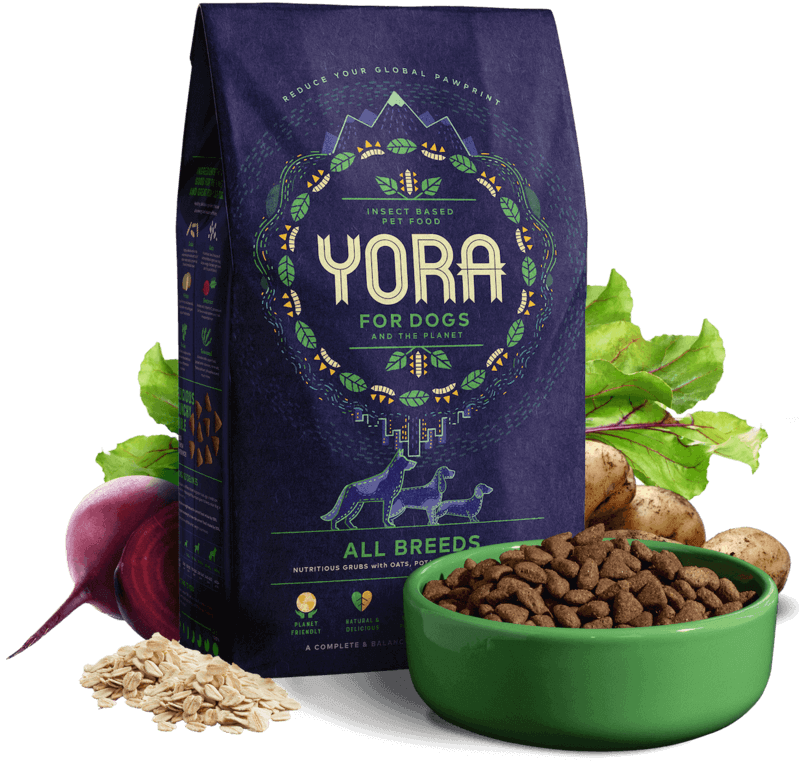 Yora is a relatively new company on the UK pet food scene, but they are making waves in the industry by not only using insect protein, but having a very clear sustainability mission. Yora’s bag is compostable, can be put in your normal rubbish bin and it will breakdown. Alternatively you could get experimental and use the bags as a potato or tomato growing bag, because of its material, cellulose, it will actually give back to the soil rather than just breakdown. Yora bags are made up of three layers, 2 layers of paper and 1 layer of PLA. The lining of the bag is known as compostable PLA, you do not need to separate the lining, like you might need to do with ‘recyclable’ packaging. Any paper used in the production of Yora bags is from a FSC certified supplier, the company neither cuts nor accepts wood from protected forests, they have put in a state of protection and conservation of 22,000 hectares of its own forests originally destined for commercial use. During the production process of the paper any waste is reused by paper mills for the production of recycled paper. Yora bags are printed with water based inks to prevent the emission of pollutants or harmful substances into the atmosphere. 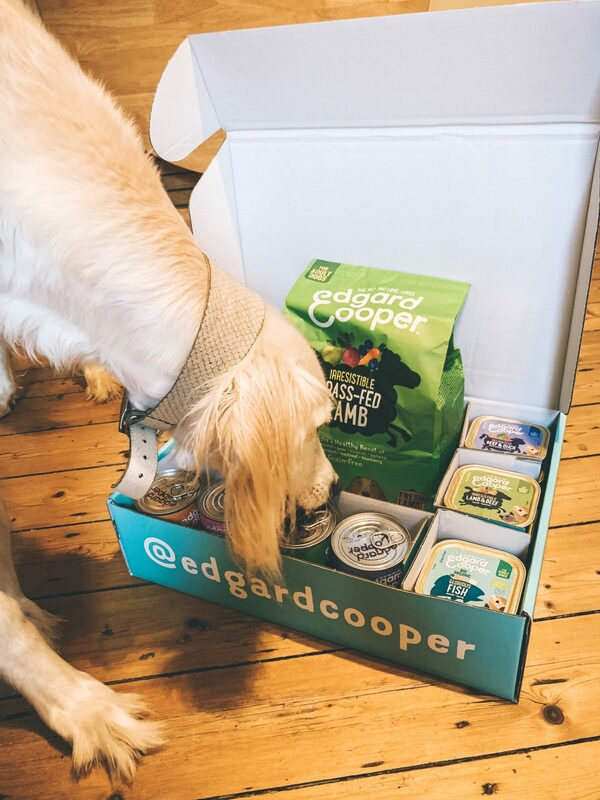 Edgard Cooper were one of the first pet brands to introduce a 100% biodegradable kibble bag. The new treat range are all in 100% biodegradable packaging, which is made from vegetable fibres. All Edgard Cooper tins and cups are recyclable and their products are almost entirely plastic-free. The company try and reduce environmental impact wherever possible, for example, by using non-toxic paint and printing on recycled paper. 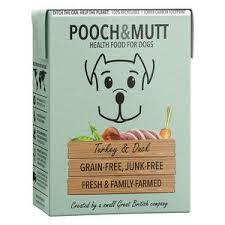 Pooch & Mutt have stared using a 100% recyclable Tetra pak for their dog food which reduces global warming impact by 80%. Company wide, they are making a move against single use plastics aiding to significantly reduce co2 in the environment. Tetra Recart lower packaging weight and improved space on shelf meaning that it is perfect for City Dog owners who are short on shelf space. 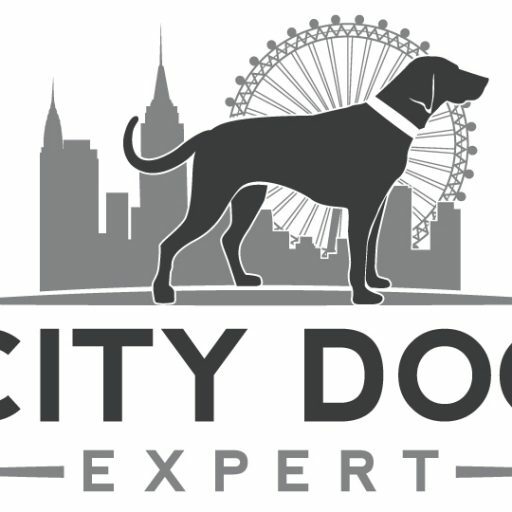 It was Different Dogs who first made me aware of how environmentally friendly a dog food company can be. Different Dogs use Sustainable Packaging which is eco friendly. The company uses Kraft cardboard pots and trays for their recipes, recyclable boxes to deliver the food in, wool insulation (not vegan friendly sadly) to keep the food cold (no polystyrene in sight), biodegradable bubblewrap to protect the food. 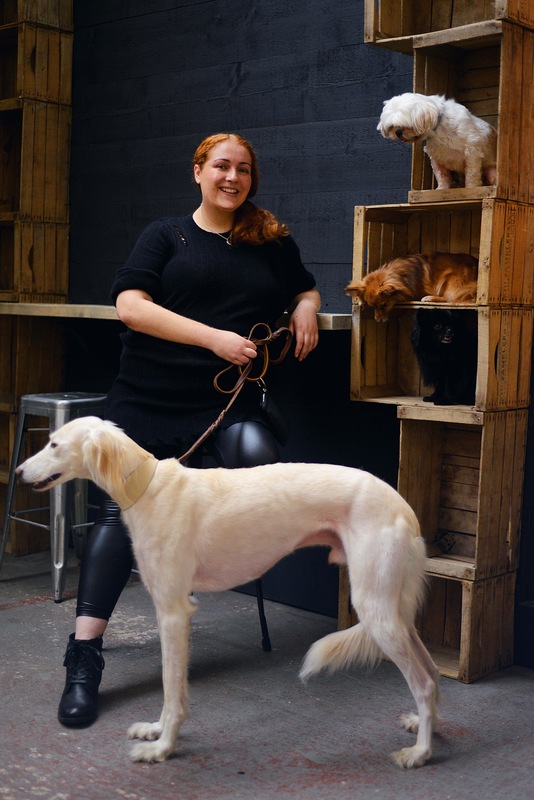 From April 2019 Different Dogs are to be plastic free in their stockists. Their new retail packaging will be cardboard, PLA (plant starch) lined and 100% compostable. 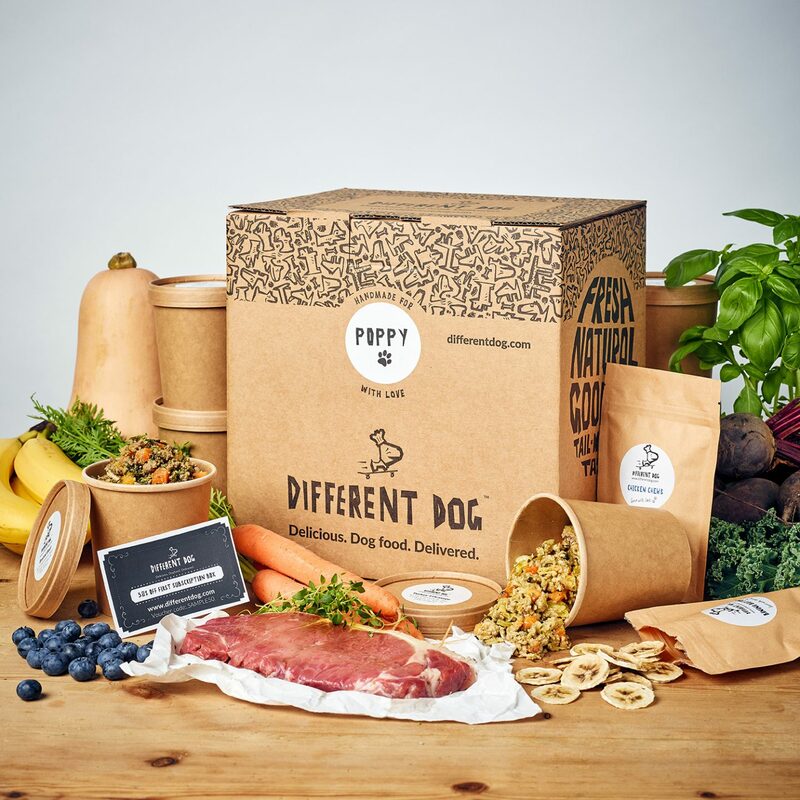 Reducing carbon footprint is also important for the team at Different Dog where they are piloting a scheme to reduce deliveries to help reduce carbon footprint and source all ingredients locally. Beco makes sure their 2kg bags are 100% compostable with water based dyes and even the resealable zip is made with compostable cornstarch. Sustainability is important to the company and they use wild caught Marine Stewardship Certified (MSC) cod and haddock in their fish recipe. This means each fish can be traced back to the boat and sustainable fishing practices can be guaranteed. They also only use ethically soured East Anglican free range chickens and turkeys in their other formulas. 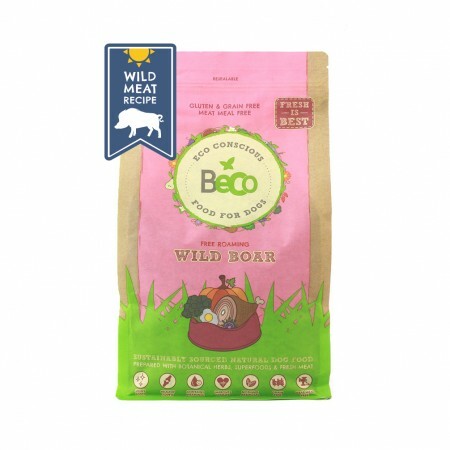 Instead of using high carbon red meats such as beef and lamb, Beco use wild boar. Lamb has a carbon footprint of 39.2 (39.3kg of emissions to produce 1kg of meat) and wild boar has a carbon footprint of 0.9kg due to no need to use agricultural machinery and therefore producing less methane when they eat. All Beco food is manufactured in Cumbia, UK to keep air miles down. They intentionally avoided using ingredients that need to shipped long distances such as sweet potato (often imported from North America and China). Instead, we use home grown alternatives such as white potato. If these companies can lead the way in forward thinking, environmentally friendly packing, what’s stopping everyone else?